The following text is engraved on a large grave style stone which is at Black Kettle National Grasslands, the site of the Washita Massacre in western Oklahoma. The pictures above and below were photographed from the same stone. Red on red may be a little hard to read so go slow; it is written in blood. The Battle of the Washita, a major engagement in the Plains Indian War which established the western expansion of the United States was fought on this site. Col. George A. Custer's command of 500 troopers from the 7th cavalry, and a detachment of scouts including the famed Ben Clark and the Osage, Hardrope, destroyed Chief Black Kettle's Cheyenne village here on Nov. 27, 1868. 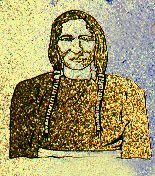 Black Kettle, peace leader of the Southern Cheyennes, had sought military assurance that he would not be attacked here. There were in his camp, however, young men who had taken part in war parties raiding in Kansas. Custer's command left Camp Supply on November 23. His scouts located the Cheyenne village on the night of November 26, after a forced march through a bitterly cold blizzard and deep snow. Custer deployed his command to surround the village, and at dawn, with the regimental band playing "Gary Owen," swept in to attack the sleeping Cheyennes. The number of Indians killed in the fighting is a point of controversy. Custer claimed 103 warriors. In the report to the secretary of the interior (1869 - 70) Cheyennes set the total at 13 men, 16 women, and 9 children, including Black Kettle and his wife. Captain Louis Hamilton, grandson of Alexander Hamilton, was one of two officers killed. Major Joel Elliott and a squad of troopers in pursuit of fleeing Cheyennes were trapped on Sergeant Major Creek beyond a mile from the village and killed to the last man. The Cheyenne lodges and winter supplies of food and buffalo robes were burned, while 875 of their horses were slaughtered. At nightfall, the cavalry returned toward Camp Supply, with 53 women and children captives.